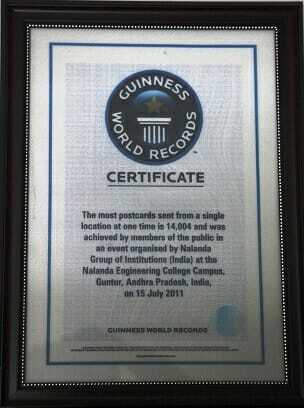 The most postcards sent from a single location at one time is 14,004 and was achieved by members of the public in an event organized by Nalanda Group of Institutions (INDIA) at the Nalanda Engineering College Campus, Guntur, Andhra Pradesh, India on 15 July 2011. 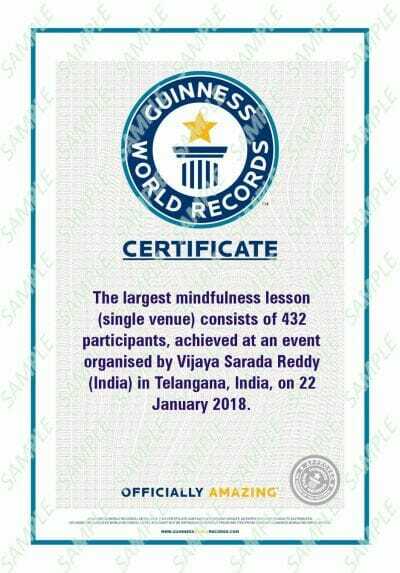 The Largest Mindfulness lesson(Single Venue) consists of 432 participants, achieved at an event organised by Smt. A. Vijaya Sarada Reddy(INDIA), Secretary, Holy Mary Group of Institutions in telangana, India, on 22 January 2018.